By the time I became a pastry chef in the mid 1990s tiramisu, the decadent Italian dessert that defined the 80s, was banned from all high-end restaurants. It was a matter of bad PR, not because it wasn’t well liked or frequently requested. In fact, it was its very popularity that took it down. We pastry chef types just got bored with making it all the time to satisfy the demand. The same fate took down the molten lava cake and flourless chocolate torte. But, as happens with all good things, they find their way back in fashion. I predict the humble tiramisu will find its way onto a menu near you. If I happen to be wrong about this, we can have our own revolution and make it at home. This version was inspired by a recipe from Joanne Chang’s book, Flour. Yes, she apologizes for making it. 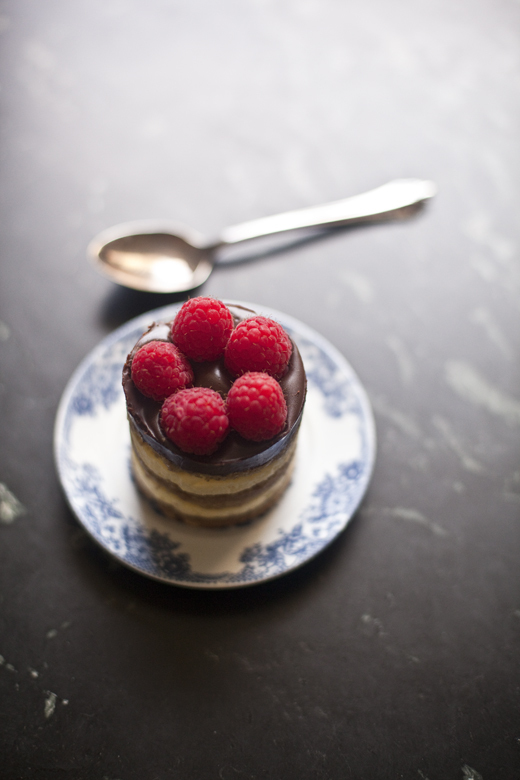 I stand proud and layer espresso sponge cake, soaked with coffee and booze with rich mascarpone mousse, then top it all with chocolate ganache and raspberries. The trick is to soak the layers just enough to impart flavor and make them delicate, but not so much that they become soggy mush. The bite of the coffee and liqueur is perfectly mellowed by the custard, but none of it is overly sweet. I built them as individuals, using PVC pipe that I had cut to the right size (super cheap), but you can buy circular pastry molds (kind of expensive) or even washed out cans (sweetened condensed milk is just the right size). You can do this exact same recipe in a small trifle bowl or in short water glasses. This cake makes me think of sitting on the porch swing in my Italian grandmother’s lanai. It was about 1973 and I would have been 6 years old and eating something sweet and spring-like. She had hanging baskets of flowers dangling from the ceiling from elaborately woven macramé; in shades of orange, chartreuse and gold. 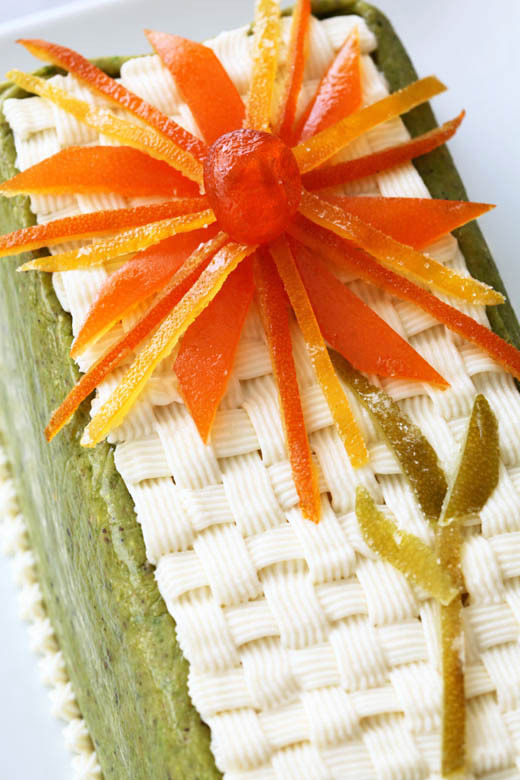 I’m sure I was eating Jell-o, but it should have been this cake, with its basket weave icing and magical candied fruit flower. Ok, truth be told, my grandmother isn’t Italian, she didn’t have a lanai, I just like the word, and there probably was macramé, but I don’t actually remember any. But, this cake makes me wish all these things were true. Not only is it visually stunning, but the cake is so delicious I licked the plate clean. This week was my husband’s birthday and he requested a true American classic for his cake, Boston Cream Pie. Light pillowy sponge cake with layers of rich vanilla pastry cream and topped with a smooth chocolate glaze. Why do we call this cake a pie? It was invented in the 1850s by a French pastry chef working in Boston. My theory is that he got lost in translation and mistakenly called it a pie! (but I’m making that last bit up.) Whether the name fits or not hardly matters, it is delicious. In fact, my family loved it so much the four of us ate the entire 8-inch cake in one sitting. I was thrilled except I never got a picture of it for this post.